As you may have seen in Tony’s post not long ago, I organized a Blind Review Challenge. 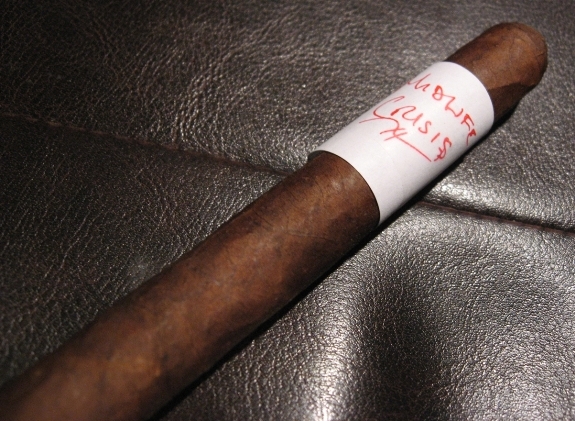 Check out Tony’s summary of the mystery cigars he received here. Now it’s my turn to wrap up my trade with a review summary. I really enjoy setting these up. As Tony mentioned, it allows you to pick up a cigar and smoke it with no biases on brand/wrapper/blender/price. When you think about it, there are a lot of things that can affect your opinion that you may not even realize. It could be a cigar you’ve had before, or one you’ve never tried. Sometimes it’ll confirm your first impressions or maybe introduce you to a new brand that you would have otherwise overlooked at the B&M. This set of blind cigars comes from dk_fxn, you can find him on twitter @dk_fxn. He sent me the following 5 cigars as well as bombed me with some other awesome smokes such as an AF Shark, Opus X and an Illusione culebra. He even had the creativity to name them all uniquely. Can anyone tell me the link between all the cigar names?? Thank very much for the bonus sticks dk_fxn! Now let’s get on to these reviews. I did them in short paragraph’s and jotted them down as I smoked them, so it’s all based on what I thought at that exact moment. Hope you enjoy! 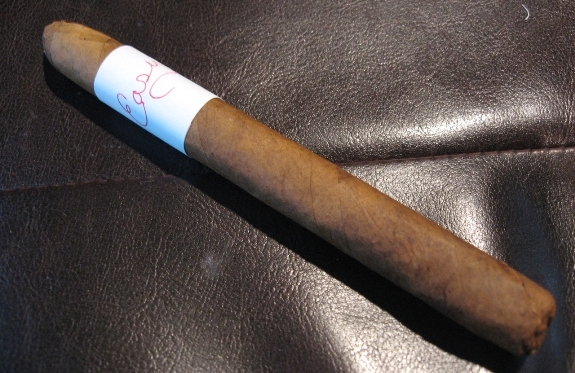 A toro shaped cigar measuring in around 6 x 48. 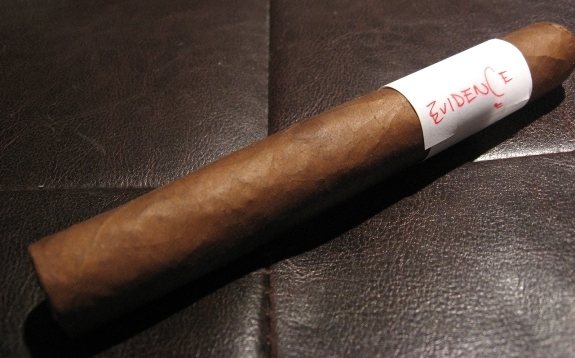 The wrapper is a nice medium shade of brown, not quite maduro but not quite Connecticut, maybe a Habano? It’s clearly constructed and has no major veins. The aroma on wrapper and foot is mostly hay/barnyard and pre-light draw leaves a big spice kick on my lips. The toasting was nice and easy and the initial draws brought flavors of toasted cedar and a bit of leather added to the peppery spice which is actually very minor at this point. The spice settled right down after an inch and a nice toasted cedar has taken control with a bit of earthiness and nuttiness mixed in there. Body starting off fairly mild but close to the medium threshold. The ash on this cigar is very nice, it’s white, strong and clean. It lasted nearly two inches before I tapped it off. Retrohale has been bite-free with a smooth cedar finish since the start. I’m surprised more spice didn’t come through on this since i was expecting a lot of spiciness after the pre-light draw. The cigar has also been a smoke machine since the start, never letting me down and has been burning razor sharp through the first half. Some more spice came into play just past the halfway mark, like a peppery nutmeg type of spice. the body and spice developed a bit more near the end but it stayed with a nice cedar flavor straight to the end with no bitterness, very enjoyable cigar! Post-Reveal Notes: I’ve only previously had the Cain Maduro and Habano and both were quite powerful. This one however only barely passed medium. I’m not sure if it had some age on it or what it was, but is was a nice smooth and spicy cigar. Very surprised at this one. 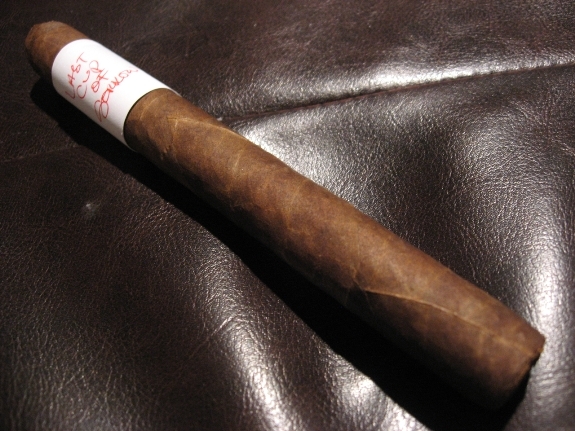 A Grand Robusto or maybe 6×60 shaped cigar with a nice dark cinnamon colored wrapper. It’s fairly smooth with a couple veins but nothing that looks problematic. The wrapper has a very nice oily sheen to it and is mostly hay/barnyard scented. The foot has a very nice aroma of cedar, barnyard and a bit tartiness. The prelight draw has a nice cedar flavor with some raw nutmeg and cinnamon spices. Initial draws are very very peppery with an undertone of cedar. The pepper-bomb died down shortly after and balanced nicely with the cedar, also getting a sort of toasted bread note and a nice creamy finish. The ash is a bit messy, I needed to tap it off after an inch the first time. I’m also having some burn issues where the cigar doesn’t stay totally lit and I have to purge or touch up, I’m blaming it on the weather since it’s -6C (about 22F) outside right now. The cigar has a nice bite on the retrohale, nothing over powering, and a smooth creamy finish. It started off just about medium and is holding steady so far. At about the halfway mark the flavors haven’t changed a whole lot but that’s ok cause I’m enjoying them. They are well balanced and alternating turns being the most prominent, the toasted bready flavor is especially nice. Passing the halfway mark and the peppery spice is really picking up, as is the body. In the full range now. The creaminess is gone and getting some leather in the mix with a bit or earthiness. The bite on the retrohale picked up as well with a cedar finish. The cedar eventually turned to a burning wood flavor, not really in a bad way, just different. It finished nice and full with the pepper and burning woodsiness balancing nicely. 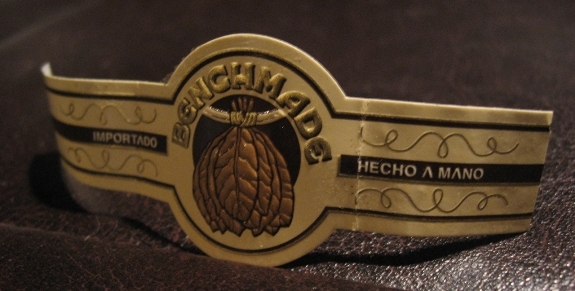 Post-Reveal Notes: This is one of the cigars that I would normally overlook in the B&M. The peppery flavors are not exactly up my alley but I can say that this was a well balanced cigar and would recommend to people who enjoy the fuller and more peppery-type cigars. The “Easy” is a Corona shaped cigar with a tapered cap at the head. It has a rough appearance with some bumpiness and rough lines, makes it appear old. There’s one section with some major veins and a knot running through most of the cigar, hopefully they won’t cause any problems. The wrapper has very faint aroma, maybe of just some hay/tobacco and foot is pretty much the same since it’s a shaggy so I can’t really get a good aroma off the filler. Initial draws and construction seem to be pointing my guess towards a Cuban but I’m not sure. I got one very interesting flavor here that I think I’ve never had before. While toasting and initial draws I got a Pine taste. Was actually very good paired with some cedar and spice. Spice quickly took a backseat to the cedar with a smooth leather and clove finish. So far going very well. Construction has been perfect, no burn issues at all and ash is a nice light grey color and holding steady just past an inch each time. Body is fairly mild/medium and retrohale his a tiny little spice bite and a cedar finish. Lots of smoke on each draw. As I approach half-way some more spice is making an appearance, getting a bit of pepper and some saltiness. Shortly after the spice took a back seat again while the saltiness stayed and some dried fruit flavors snuck in, I’m loving all the subtle flavor changes here. The flavors kept taking turns to the end with only a hint of bitterness but nothing off-putting. This cigar had it all, construction, burn, and a nice variety of flavors. It was very similar to some run-of-the-mill/basic Cubans I’ve had, if its not a cuban they did a damn good job making it taste like one. It wasn’t overly complex but a good quality smoke, definitely enjoyable. 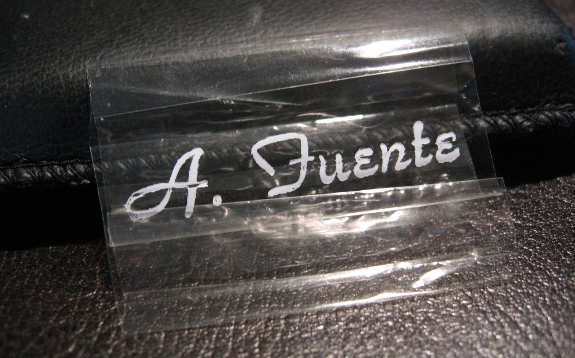 Post Reveal Note: A budget Arturo Fuente? They hit this one on the head! I found them online for about $2 or less. Definitely a great purchase and an easy cigar to hand out to friends who aren’t smokers. I think this will make a perfect choice for a lot of situations, even when you’re not paying it much attention. From some discussions I’ve had about this cigar, seems a lot of people overlook them. I’ve personally never seen them but they are definitely on my radar now. Perfect cigar to throw into a blind tasting! A corona sized cigar with another oddly tapered, or maybe pointed, head. The wrapper is a nice mild chocolate color with lots of definition but no major veins. The wrapper gives off a sweet tobacco and barnyard aroma, the foot is closed with wrapper lead so not much of a difference in aroma there. Pre-light draw is mostly cedar with a bit of spice on the lips. Had a bit of a tough time getting this lit. Initial draws are packed with cedar with some subtle coffee notes. The cigar is leaving a dryness on the back of my throat that I’m not too fond of. There’s not much interesting going on in the retrohale right now, very small bite and some cedar/tobacco flavors. Body is almost in the medium range for me so far. Having a hard time keeping the cigar lit, keeps tunneling on me. The current temperature out here of about 17F might have something to do with that… The coffee flavors have developed a little more and I’m getting some nutmeg type spices. a nice change. Unfortunately the dryness on the back of my throat is still an issue but nothing to toss this cigar away for. Around the half-way point some of the dryness seemed to stop, not completely but much improved. The coffee flavors developed a bit more into a nice espresso type of note and some leather and sweetness came into the mix. The body is slowing building up and the bite on the retrohale got a little more aggressive too but with a nice espresso finish. The burn also got much better in the last half. With about two inches left I’m getting a new flavor I can’t quite pinpoint that is very tasty. It’s almost like maybe freshly baked goods, interesting! Definitely some more woodsy flavors, nutmeg and the espresso is turning into a bit of a bitter espresso, but not in a bad way. It finished off with mostly a sweet and bitter espresso flavor. Just an awesome finish, it was so tasty it could easily be compared to drinking a nice hot espresso. I kept expecting it to turn bitter but it never happened. Finished super smooth and damn tasty. I have absolutely no guess on this one. It started off decent with some straightforward flavors and a dryness on my throat but really started to shine about halfway in. I can’t stress how good the last 2 inches was, tons of flavor and amazingly smooth finish. Post Reveal Notes: A Tatuaje Black! Awesome! A Very rare gem and I’m very glad I had the chance to try it. Thanks so much for this one DK! Even though the start wasn’t as exciting the finish was just fantastic! A nice looking Grand Corona sized cigar with an interesting looking wrapper. The wrapper has lots of definition to it. Each vein, no matter how small, seems highlighted in a light brown color against the wrapper mainly milk-chocolately wrapper. The head is finished with a pigtail and there are definitely a few soft spots along the cigars body. The wrapper gives off an aroma of sweet cocoa while the foot is more barnyard scented with some hints of spice. Pre-light draw is more barnyard and a touch of spice. Initial draws offer me a blast of pepper with some subtle coffee notes. I think there may be a Pepin influence going on here… The spice slowly started fading as the cigar progressed and the coffee notes made a more prominant appearence with nutmeg-life spice. Burn has been razor sharp since lighting. The ash is also very nice and clean and holds on just past an inch. The cigar seems to be right at the edge of medium so far with a nice bite and cedar finish on the retrohale. At about the half-way point the pepper is still kicking around with the coffee and nutmeg. Hasn’t changed much but I’m enjoying the current balance. The pepper fades in and out of strength now and then, but it’s always there. As I got into the last third the pepper and body both kicked it up a notch. The coffee and nutmeg is still around but it’s taking a backseat to the pepper. Can’t say I’ve had this specific cigar before but I’m almost 100% sure it’s a Pepin blend, maybe one of the 601 or DPG lines. Post-Reveal Notes: Looks like I was right! The infamous Pepin definitely did have a hand in blending these cigars. They are super budget friendly and pack an interesting mix of flavors. I’ve heard about them but always overlooked them as “just another budget cigar”. But they can definitely stand alone as a good smoke! So if you actually made it down this far thanks for reading! This was yet another fun Blind Review Experience! Tony and I were thinking of setting up a blind review with some of our readers, would anyone be interested in participating? Let us know via comments or even email us directly! Thanks Kekoa and dk, I couldn’t agree with you more! That’s why I really love setting these up! See my note in the last paragraph about setting up a blind review for our readers, would you two be interested? Anyone else interested? I’ve said it before and I’ll say it again…. 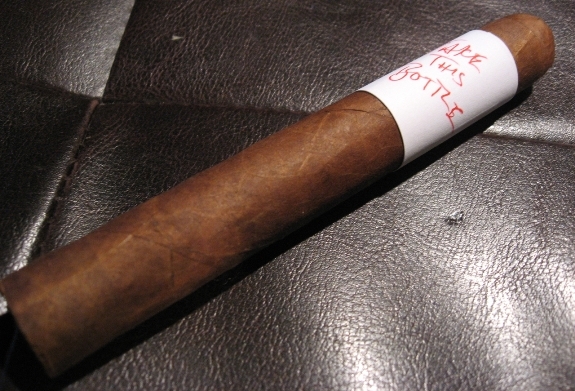 blind reviews are without a doubt the best test of a cigar. There are no biases based on brand or origin that can come into play, when the cigar is smoked blind. Keep up the great work! Great reviews Daniel! I’m really glad you enjoyed them. I have to agree with the guy above. Not knowing what a cigar is really takes away any bias that you may have and give you the opportunity to try something you may never pick up. They all seem great to me. Great reviews Daniel. By the way, I love the photos and the contrast of the labels with the leather. @boomerd35 I know what you mean and I used to think the same way. But your subconscious plays tricks on you when you see a certain price or a certain brand! Same can be said about food. When a plate is presented nicely, doesn’t it seem more appealing then if it’s all mashed together? @Mike B. – Thanks for the comment Mike, sk_fxn went over and above on this trade, especially with that super rare Tatuaje Black, I owe him a big thanks! That’s really neat that your local B&M does these, what cigar surprised you guys the most after tasting it blind??? Great reviews. I know I have my own biases because when I take the band off a cigar I’m smoking-even then it doesn’t seem as good. I know there’s no way that the band can influence the taste, but I I’m sure my mind influences my perception in some way. BTW- I’d be interested in a blind review. I agree with kekoa. We do blind taste get togethers at our local B&M. They are the best way to judge a cigar on its own merits, not the name on the wrapper to give predudice. Daniel great reviews and thanks go out to dk_fxn for getting you some great cigars to review. @Tadd – Awesome! Keep an eye out, we’ll make a post about it. @blane – Let us know what you think of them when you get a chance. Can’t go wrong for $2! Does no one know the link between the cigar names??? Great stuff…. I might be interested…. What a great job.I think I will try a fiver of curly heads. I’m really enjoying yoru blind reviews! Its not only interesting reading the review as it stands, but then also your thought processes to trying to figure out what cigar and/or blender was involved. And yes, I would definitely be interested! Love the blind reviews, very nice! The Fuente Curly Heads used to be made from floor sweepings and were the yardstick by which all dogrockets are measured. It’s nice to hear that they’ve improved. Faith No More song titles? I could answer….. But Craig seems to be correct. @TriMarkC – Thanks for that, they are really fun! It’s interesting to see how some blends have that signature flavor. And thanks for the input, we may have an interesting opportunity for the readers! @CigarCraig – lol, maybe I can make my own curly heads from the straw broom in the garage! hahaha. If you’ve had an older one I’d be curious to hear if your opinion changed for the recent sticks?? Thanks again for these! As others have stated, your eyes play a huge role in what your brain perceives with cigars, i.e., marketing propaganda, artwork and known price. I’m interested in the blind reviews. Not sure my palette is as refined as you guys’ but it sounds like fun. To DK: LOVE the FNM bands on the smokes. @Jake – Everyones input is important because everyones palate is different! You might catch something that me or Tony may never catch at all. Each pairing plays a huge part too. Keep your eyes open for the post for the next round of blinds!